Growing up, my sister and I used to dream about getting into the book of Guinness World Records. Even though we didn't quite manage it, and never mastered a talent worthy of its pages, it's still exciting to hear who's scoring the most achievements in 2016. Despite giving the MTV VMAs a miss on Sunday, Justin Bieber has proven that when it comes to winning awards, he's a real pro. Bieber won eight Guinness World Records, because he's awesome, and proving that Purpose is still a big deal. Bieber's eight Guinness World Records honor a number of accomplishments the singer has achieved this year, all of which confirm how important his album Purpose is. Notably, the singer has beaten previous records set by fellow artists like Rihanna, some of which may surprise you. For instance, in December 2015, Bieber had the most simultaneous tracks on the US singles chart. And he didn't have just two or three tracks on the chart, but 17 songs "scattered amongst the ranks on the Billboard Hot 100." 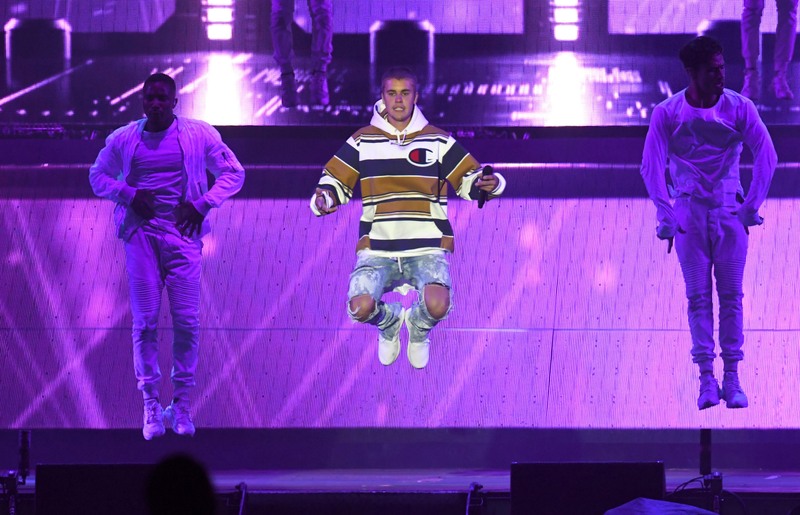 To have quite so many songs on the Billboard Hot 100 at once isn't just impressive — it's ridiculous — and proves just how popular Bieber's latest musical offerings have been. Social media plays an important role in Bieber's latest win, with one of the awards celebrating the fact that the singer continues to be the male Twitter user with the most followers. Currently at over 87 million, Bieber's online fans are dedicated to staying up to date with the singer, which is why so many Beliebers were devastated when he recently took a break from Instagram. He's also the male musician with the most YouTube subscribers, and has the most viewed channel on YouTube of any individual. It's hard to imagine having quite that many subscribers or views, but just goes to show how hard the "Sorry" singer has been working over the past year, and that he's still constantly connecting with his fan base world wide. Despite a public feud with Selena Gomez, leaving Instagram, and missing the MTV VMAs, by acquiring eight Guinness World Records, Bieber has shown that his album Purpose made a big impact on the world when it came out, and continues to do so. I'm certain that there will be many more awards in Bieber's future, but it's fun to see him break so many records and be featured in everyone's favorite book.